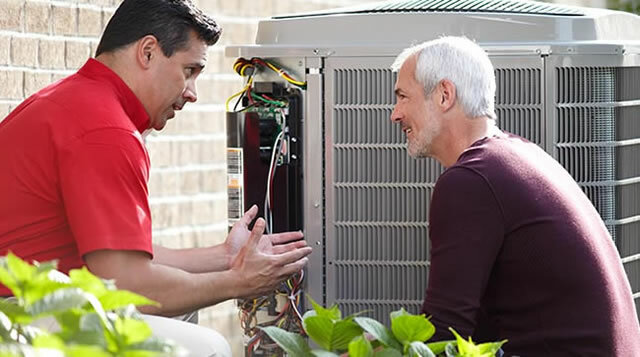 AC repair does not need to cost an arm and a leg. Not only can we get your AC Repair done quick, Harding's A/C can do it at a price that won't break the bank. Once we have evaluated what is wrong with your air conditioner we will tell you up front what the a/c repair will cost. This means that there is no surprise when it comes to AC repairs with us. Before you call for that AC repair consider doing a little due diligence on your own. It could save you a few dollars and more importantly get you back in cold air a lot faster. Check the filter. If the filter is dirty in all probability this could be causing ice to build up on the evaporator coils. When ice builds up on the coils it restricts the amount of air that's coming to the ductwork. You could replace your own air condtioning filter for as little as two dollars. If you call for an AC repair you could get stuck with a diagnostics of $60 to $99 for them to tell you what you might be able to fix yourself. Check the breaker in the electric service panel. In all probability there is a pretty good chance that if the breaker has been tripped by your air conditioner you have a problem that will need to be addressed. However, if the AC is allowed to cool down for an hour you may be able to reset that breaker. Yes, you are still looking at a potential HVAC repair to establish what caused the breaker to trip but that does not mean you have to sit in a hot house until someone gets there to take care of it. Check your condenser fan motor to make sure its turning. This is in all probability not something that you could fix on your own. If you can call an HVAC repair company and let them know that your air conditioning condensing fan is not turning they can give you a potential estimate over the phone. This will make it so that you are aware of what it will cost for them to come out and make the AC repair. If you contact Harding's A/C and you have some idea of what’s wrong, we are happy to quote the cost over the phone.